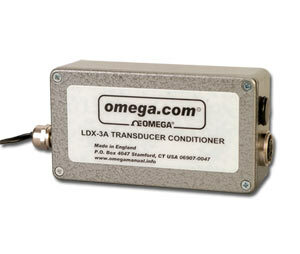 The LDX-3A is a compact oscillator/ demodulator unit with adjustable span, zero and phase controls for use with any OMEGA™ (as well as most other manufacturers) ac LVDT transducers. The unit is housed in a die-cast aluminum box providing a high degree of mechanical and environmental protection. The LDX-3A incorporates its own regulation for operation from ac power of 120 V. A 2.7 m (9') power cable is standard. The unit can drive outputs of 0 to ±5 V into 10 kΩ, or ±20 mA into 100 Ω max. This, together with a 10:1 range of span controls, makes the LDX-3A a very versatile single-channel conditioner for a wide range of transducers. Output Voltage: ±5 V into 10 kΩ min. Output Current: ±20 mA into 100 Ω max.